ABOVE: An Orlyval train arrives at Orly-Sud. INSET BELOW: Airport sign for the Orlyval train and Orlybus, which connect to Paris RER and Métro stations. Need a hotel near Orly Airport? Europe's no. 1 hotel site, Booking.com, has guaranteed lowest available rates. Until Charles de Gaulle International Airport opened in 1974, Orly Airport (ORY) was the main aviation gateway to Paris. It's still the second-most important airport in the Paris region, with dozens of airlines connecting to cities throughout Europe, the Middle East, and Africa. Orly is located 14 km or about 9 miles south of central Paris, on the opposite side of the city from Charles de Gaulle. It has two terminals, Orly-Sud and Orly-Ouest, both of which are smaller and easier to navigate than their counterparts at CDG. 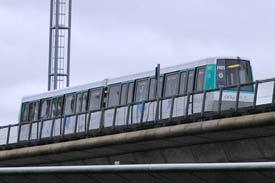 Orly has good transportation into the city, and it's especially convenient if you're staying on the Left Bank. Ground-transportation options include the Orlyval train, several bus lines, taxis, and shuttle vans. For details on each, including Web links, continue reading this article or use the navigation table below.